Osprey's intriguing Talon 44 may well be the most load-worthy fast-and-light climbing pack ever built. While most makers struggle to get packs in this class near three pounds, the Talon comes out of the box at a preposterously light two pounds, nine ounces. In terms of weight, that easily puts the Talon in the day pack category. 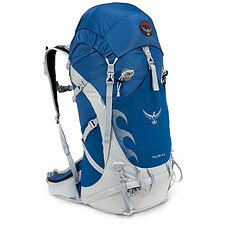 Indeed, the 44-liter Talon weighs a mere two ounces more than my favorite day pack, the 30-liter Black Diamond Speed. None of this would be especially newsworthy but for the fact that Osprey has designed the Talon specifically for multi-day backpacking. Can a pack this light actually handle overnight loads? The answer is yes. The Talon comfortably manages 35 pound loads, and indeed the suspension seems capable of carrying a great deal more. To accomplish this feat of pack magic, Osprey has turned to the past for inspiration. The Talon's frame eschews the normal single-stay plus frame sheet, instead employing something that looks a look like an old external frame design. Like your dad's vintage external frame pack, the Talon has an inverted, U-shaped frame that is square across the top, transferring force directly from the shoulder straps to the hip belt—no frame sheet required. The design is so simple and elegant, you just have to wonder why no one else is doing it. And it works: stand the Osprey on the floor and push down, and you get an instant sense of the Talon's healthy stiffness. In the field, these elements work as expected, keeping the load tight against the back and off the shoulders. I don't expect the Osprey's frame will be the limiting factor in carrying weight. Rather, the soft waist belt is likely to cause trouble when you start pushing the weight rating (I'll report more on this after a few winter tours). The Talon does not feature thickly padded shoulder or waist straps. Instead, the Talon employs a thin, ventilated foam covered in open mesh for maximum breathability. The design is innovative—perhaps too much so. Unquestionably, the straps are highly breathable, outperforming anything I've seen in this regard. But the smooth mesh and soft, flexible foam tend to shift against clothes or skin. Can such thin straps prevent hot spots and bruising with heavy loads? I'm not yet a believer. On the subject of breathability, I must mention the Talon's back panel, which features both a primary vent channel against the spine, as well as a secondary corrugated foam-and-mesh system to allow air to flow against your back. Osprey calls this the "Airspace", and it works beautifully. While hiking, I could actually feel air circulating against my back, making the Talon a top choice for high-output hiking in hot climates. On the other hand, there are times when you wish Osprey would be a little more willing to stick with traditional, tried-and-true elements. The Talon lacks an effective expansion collar, for example. You get 44 liters of volume here and not much more, which is sure to make space tight when you need to pack climbing or winter gear (note: the Talon has extra exterior attachment points, plus a shovel flap, plus straps to tie your pad to the base, in compensation). You get rounded pull strings instead of normal zipper pulls, and an positively awful bungee lock to cinch the collar (I replaced it). A definite quirk is the Talon's bird-themed buckles. Yes, they look like little wing silhouettes, which is cool, but functionally the buckles are inferior to a straightforward design. Osprey also adds pouches to the waist belt; I'd rather these were optional, to allow me to use my own belt accessories instead. These little quirks can add up over a long haul, adding a needless measure of annoyance. Still, the bottom line here is the Talon's unbelievably low weight. The Talon crushes the 3-pound barrier, yet has the frame to compete with true overnight packs. I've been impressed enough with the Talon to want to load it up with skis and winter gear (if it will fit!) and see what happens. No matter what, Osprey has created a innovative pack that redefines what is possible in this weight class. If you want load-bearing performance without the weight, I don't see anything else that compares.